Oil on panel, 102 x 72,5 cm. This painting was originally bought in Paris as a work of the Flemish Baroque painter Peter Paul Rubens and dated back to 1616-1620. Later, it was attributed to Anthony van Dyck as one of his very early works. It is a three-quarter length portrait in natural size. 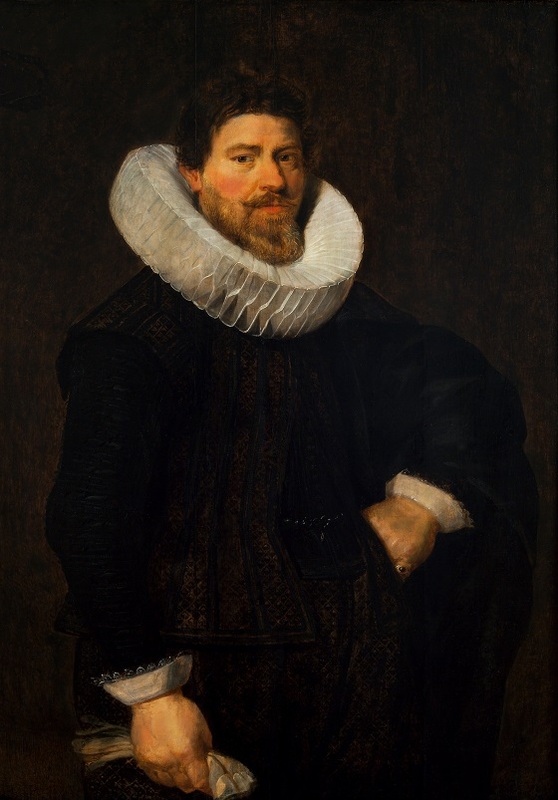 The man is wearing a black, finely patterned outfit with a broad ruff, a clothing item which was particularly popular in the second half of the 16th century. The style is soft and restrained, yet also expressive, and the dark palette is typical of bourgeois portraiture in 16th-century Netherlands. The portrait may have been one of a pair; in the Dutch Golden Age, it was typical for newlyweds to have their portraits painted within two years of their marriage. The traditional composition of such double portraits had the husband depicted on the left from the viewer’s perspective and the wife on the right. Couples could also choose to have their portraits painted at a later time, but this would usually be in connection with major life events such as moving to a new house or a significant rise in social status.